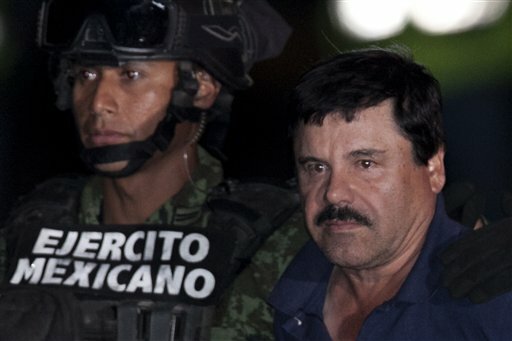 MEXICO CITY (AP) — Mexico is willing to extradite drug lord Joaquin “El Chapo” Guzman to the United States, a federal law enforcement official said Saturday, a sharp reversal from the official position after his last capture in 2014. “Mexico is ready. There are plans to cooperate with the U.S.,” said the official, who spoke on condition anonymity because he wasn’t authorized to comment. 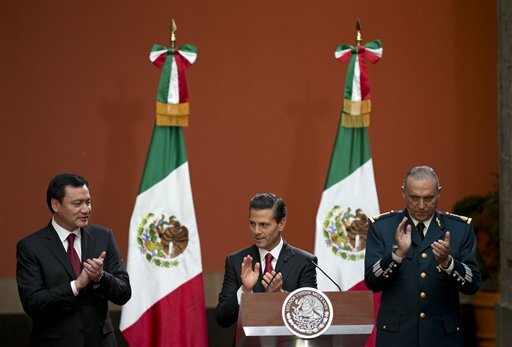 “He has a lot of outstanding debts to pay in Mexico, but if it’s necessary, he can pay them in other places,” said Manlio Fabio Beltrones, president of Pena Nieto’s Institutional Revolutionary Party. 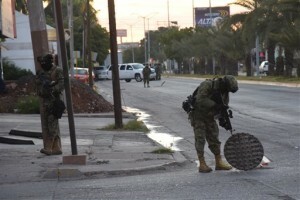 Guzman, a legendary figure in Mexico who went from a farmer’s son to the world’s top drug lord, was apprehended after a shootout between gunmen and Mexican marines at the home in Los Mochis, a seaside city in Guzman’s home state of Sinaloa. Five suspects were killed and six others arrested. One marine was injured. The operation resulted from six months of investigation by Mexican forces, who located Guzman in a rural part of Durango state in October but decided not to shoot because he was with two women and a child, said Mexican Attorney General Arely Gomez. Following his capture, the head of the powerful Sinaloa Cartel was brought to Mexico City’s airport, frog-marched to a helicopter before news media, and flown back to the same prison he’d fled. There were immediately calls for his quick extradition, just as there were after the February 2014 capture of Guzman, who faces drug-trafficking charges in several U.S. states. 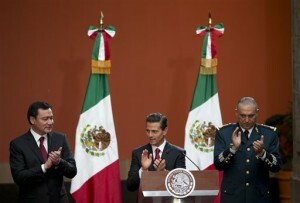 At the time, Mexico’s government insisted it could handle the man who had already broken out of one maximum-security prison, saying he must pay his debt to Mexican society first. Then Guzman escaped on July 11 under the noses of guards and prison officials at Mexico’s most secure lock-up, slipping out an elaborate tunnel that showed the depth of the country’s corruption while thoroughly embarrassing Pena Nieto’s administration. 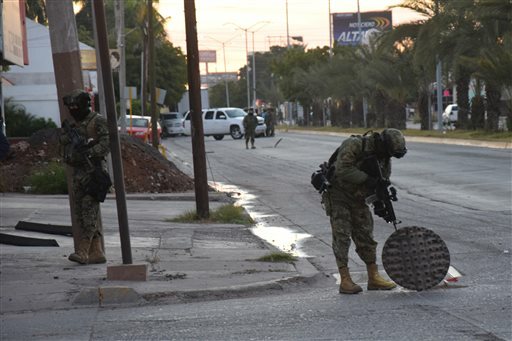 Gomez said that one of Guzman’s key tunnel builders led officials to the neighborhood in Los Mochis, where authorities had been watching for a month. The team noticed a lot of activity at the house Wednesday and the arrival of a car early Thursday morning. Authorities were able to determine that Guzman was inside the house, she said. Gomez said Guzman and his security chief, “El Cholo” Ivan Gastelum, were able to flee via storm drains and escape through a manhole cover to the street, where they commandeered getaway cars. Marines climbed into the drains in pursuit. They closed in on the two men based on reports of stolen vehicles and they were arrested on the highway. Those orders were not for extradition but just for Guzman to begin the extradition hearing process. 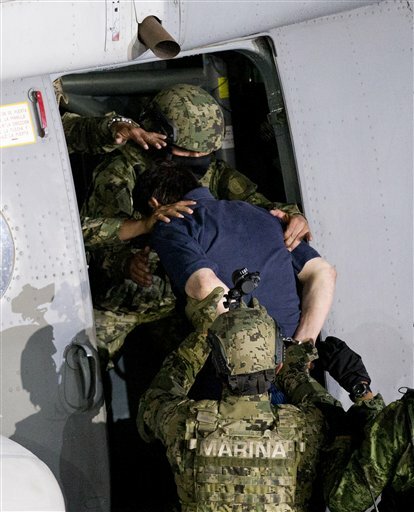 Now that he is recapture, Mexico has to start processing the extradition requests anew, according to the law. The attorney general’s office noted that Guzman’s lawyers have already filed various appeals, some overruled and some still pending. Badillo said several months ago that the extradition requests from the U.S. were the reason Guzman escaped. His second escape last year was even more audacious. He fled down a hole in his shower stall in plain view of guards into a mile-long tunnel dug from a property outside the prison. The tunnel had ventilation, lights and a motorbike on rails. Construction noise as a digger broke through from the tunnel to his cell was obvious inside the prison, according a video of Guzman in his cell just before he escaped. Associated Press writer Christopher Sherman and Maria Verza in Mexico City and Eric Tucker in the District of Columbia contributed to this report. I hope Sean Penn has beefed up his security. If El Chapo’s boys believes he helped catch him, even unwittingly, he has got problems. If this guy was born in Mexico then he’s a Mexican right ? LOL ! Let’s see what new born dip stick has to say !